Quentin Grant, Jerome Lyons and Lamine Nanky are our live musicians in Skip Miller's Hit Songs. Bringing a range of musical backgrounds to the performance, the three have spent the last few weeks creating original music for the show. Learn more about what obscure instruments they will be using and listen to a sneak-peek rehearsal track below! The M'Bira - a kind of 'thumb piano' - is a traditional African instrument popular in Southern and Eastern Africa. Looking like a guitar, sounding like a harp and played by sitting in front of it, the West African Kora is traditionally made from a large vegetable covered in cow hide, with thinly cut antelope hide as strings. These days the 21 strings (played with two hands) are made from either harp strings or fishing line. 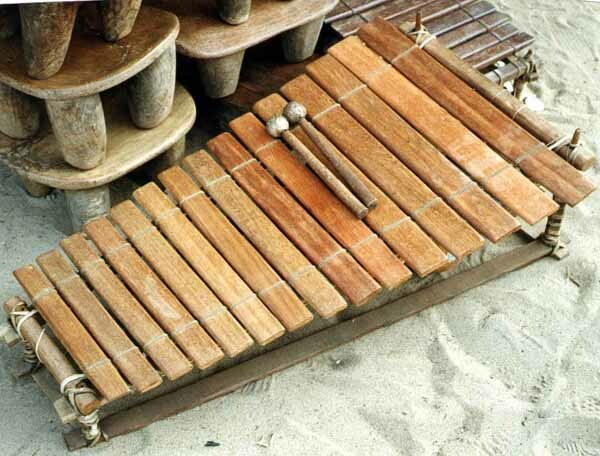 The Balafon, also West African, is similar to a xylophone. In some cultures the instrument was or still is sacred and can only be played by trained religious members at special events like festivals, funerals or marriages. The Song Gong is a Jerome Lyons speciality. Jerome runs The Cheese Factory Studio Gallery in Meadows and makes instruments under the name Tribal Instruments Australia. This one is sculpted out of a gas bottle to create a drum capable of different melodic notes. Clever! The djembe is a kind of hand drum that is apparently hard than it looks! Years of training are required to achieve the sound quality of a master drummer.